You are here: HomenextTopicsnextPeoplenext"A Chapter of my life in Billericay"
Although a “Laindon Boy” born and bred, I have lived in Billericay for 43 years. After leaving the Laindon High Road Secondary school at the age of 15 in 1957, I was currently living in the family home with my parents, two brothers and two sisters. Some how we were shoe horned into just two bedrooms! My parents rented a small timber framed bungalow in the upper half of Alexander Road from a local Estate agent, Mr Bebington. Rent was about 15 shillings a week (75 pence! ) Very basic amenities, we had gas, electricity and mains water. The down side was no mains drainage or bathroom, no hot running water. The road was unmade. My first experience and recollection of Billericay, was a visit with school pals, to Lake Meadows, a big adventure for us, as youngsters we rarely strayed out of our “home patch” Seeing Lake Meadows for the first time was a “wow factor” (up until then I had never even seen a lake before) Even today the park is fantastic, as far as I’m concerned it is still an oasis of peace and tranquility, in the heart of Billericay, a real gem and an asset to the town. Apart from the occasional mindless act of vandalism, it is still a great place to visit. Traveling to Billericay from Laindon was fairly straight forward, either via Great or Little Burstead. Another alternative was the direct route from Laindon then the B1007 up Noak hill to “Sun Corner”, and on to the rail station. An Eastern National bus with green livery and a cream “go faster” stripe along both sides, would start its journey from Tilbury river side (by the ferry). Via Grays, Orsett, Laindon, Billericay, Chelmsford, Colchester, Clacton and finally, the port of Harwich. The same bus did the entire trip, with possibly no change of driver! Our chosen route to Billericay was via Gt. Burstead. The fare was half that of an adults full fare, a shilling (5 pence) so at sixpence (two and a half pence) it was a bargain for school children. Can’t complain at that, for a trip of around six miles, further if you took the Burstead detour. The bus company was called Campbell’s, based in Pitsea. The buses were very basic, not built for comfort, fitted with a Bedford lorry engine. The bus had a conductor on board… remember them? My second sojourn to Billericay was at the age of 14. But this time it was a free trip in an Ambulance to St. Andrews Hospital for an operation to have an ingrown toe nail removed, compliments of ill fitting shoes from jumble sales! My first job and introduction to the World of work came in 1957 at the age of 15. Again I was drawn to Billericay. My first job had been arranged by the youth employment officer, through the school and the local labour Exchange (Job Centre) I was to start at a sectional building factory, based in Radford Way, Billericay. I don’t think I was going to make my fortune here, as you will see. My wage was £1.00. a day! Working from 8.00.a.m. until 6.00. p.m. Taking travel expenses from this was out of the question, at ten pence return from Laindon to Billericay, equated to twelve shillings a week (60 pence) Remember, I was still living in Langdon Hills, so cycling was the cheap alternative. I cycled through all kinds of weather, come rain or shine to Billericay and back. If I had used the bus to get to work in Billericay, I would have had to walk to Laindon station any way, to catch a more frequent bus to Billericay. 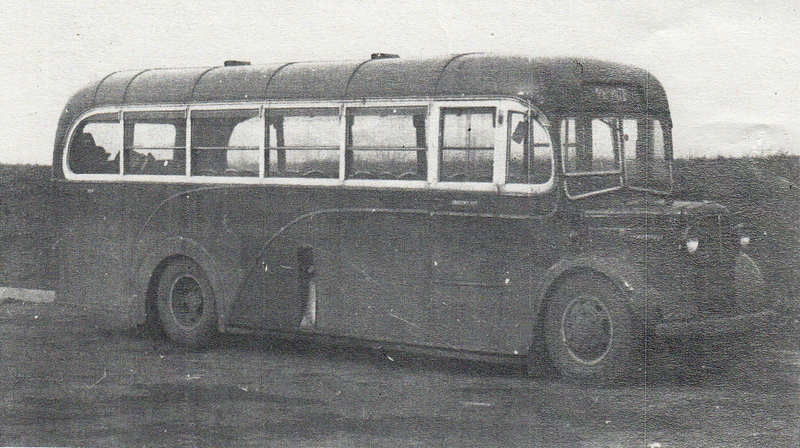 The Campbell buses were more frequent than the Harwich buses. Here is a breakdown of my wages. £3.50 to my Mum for my keep, £1.00 for myself, having treats, going to the pictures, puncture repair kits (always getting punctures due to almost bald tyres as |I couldn’t afford new ones), ten shillings (50pence) into my Post Office savings book and the same amount into my sister-in-law’s clothing club catalogue for buying my best clothes! I worked in the shed factory for about a year, like I said, I was never going to make my fortune working there, it was not a very nice working environment, noisy and dusty, from all the wood working machinery. I left. but not before securing another job with a small Billericay based builder. I was a “dog’s body” for the builder and I soon found myself in a rut, literally! Digging drainage trenches, hod carrying, mixing cement and carrying heavy roof tiles up a ladder. I realised that I was doing heavy manual labour, for a quarter of what it would cost to employ a full grown man. My wages were the same as what I had been earning in my previous job, but the work was back breaking for a 16 year old. I was still cycling to and from Langdon Hills, five and a half days a week. If anyone reading this has ever cycled from the Old Fortune of War, it is a steady upward climb all the way to Sun Corner, wind against you, then Mother Nature plays a cruel trick, the wind direction has changed and is against you going home in the evening! But at least it is down hill, Mother Nature hadn’t thought of that! Back to the Builder! When all the hard work had been done on a house I was helping to build, the builder said he couldn’t afford to keep me on any longer and teach me a carpentry skill, as he said that I hadn’t been buying any (expensive) carpenter’s tools! (The reader knows what I have been “wasting” my wages on from the explanation of my out goings). At £5.50 a week (including four hours on a Saturday morning) I must have been a drain on his bank balance. Incidently, to make sure I went to work Saturday morning, I was not handed my wages until mid-day on a Saturday! So that was an introduction to my working days in Billericay, I never sought work in the Town ever again. So how did I come to live in Billericay for 43 years, to date? I met and married my wife in Laindon. After living with my parents for a short time in one room (by this time my parents had been allocated a nice new shiny council house on the King Edward Estate in Laindon.) we were offered a small two bedroom flat in King Edward Road, we already had a little daughter and now our second child was on the way! After living in one small room, the flat was fantastic, but very cold in winter with just a small open coal fire with a back boiler for heating the water, but not very efficient. After being in the flat for three years, we had the offer of a fairly new house in Beamsway, South Green. We could not settle in that particular house and moved after two years. We managed to secure a transfer to another house near the Kings Head pub. We applied to purchase it from the Council in 1980. We paid off the mortgage eventually, but it took a bit more than my £5.50 a week wages to pay for it. 🙂 (By now I was earning a good wage on construction sites in London) To date, we have now lived in this house for 41 years! Plus two years spent at Beamsway, making it 43 years in Billericay. Just the two of us now in a house that is not being put to full use, so have decided to “down size” sell up and move on and say farewell to Billericay! We have bought a small retirement bungalow where we will see out the rest of our days, close to the sea, with coastal walks, cycle rides, pub lunches, with a roaring log fire in winter, and a spot of fishing from the beach….bliss! So ends my “Chapter of life in Billericay”. Do you remember the bus that would terminate at The Greenway, turn around and go back? My grandparents live in Salesbury Drive, Billericay and I remember boarding those buses and watching them from the hill do their turn down the road at the bottom. Blissful dreams of long ago and I’m speaking of the 1970’s.